A tasty way of cooking white fish – any firm white fish will do – especially for those hesitant about cooking fish. Add ½ tsp of chilli powder for a little extra kick. 1. Heat the olive oil in a non-stick frying pan and stir fry the onion and aubergine for about 4 minutes, until they start to turn golden. Then cover with a lid and let them steam for 6 minutes, to help soften them. 2. Stir in the paprika, garlic, tomatoes and sugar, and the salt, and cook, with the lid on, for another 8-10 minutes, stirring as necessary until the onion and the aubergine are tender. 3. 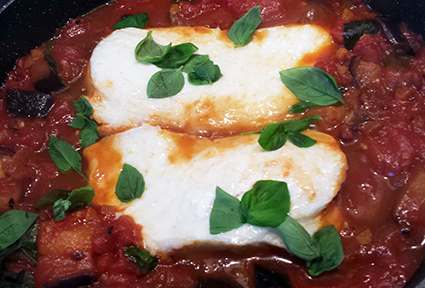 Sprinkle over the basil leaves, the place the fish in the sauce. Cover the pan and cook for 6-8 minutes until the fish flakes easily when tested with a knife. 4. Tear over the rest of the basil leaves, and serve. You can serve with a salad, crusty bread, asparagus stems…or whatever takes your fancy.